Duke Brakes carries the Sibre storm brakes. 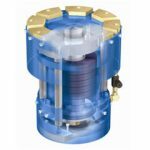 Designed for rail mounted cranes in order to prevent damage caused by storms or power failures, these storm brakes are known for their reliability and solid built. Whether you need a new brake, specific replacement parts or service, Duke Brakes has what it takes. Please view our product listing below or contact us for more information.